After the Paris Climate Agreement, many nations made commitments to increase the share of renewable energy fed into their electric grids. This is a critical step in turning the corner on climate change. More important are the utilities, banks and business leaders who finance and develop utility-scale solar and wind energy projects. China is now the clear front-runner in renewable energy development, and every nation can follow their lead. 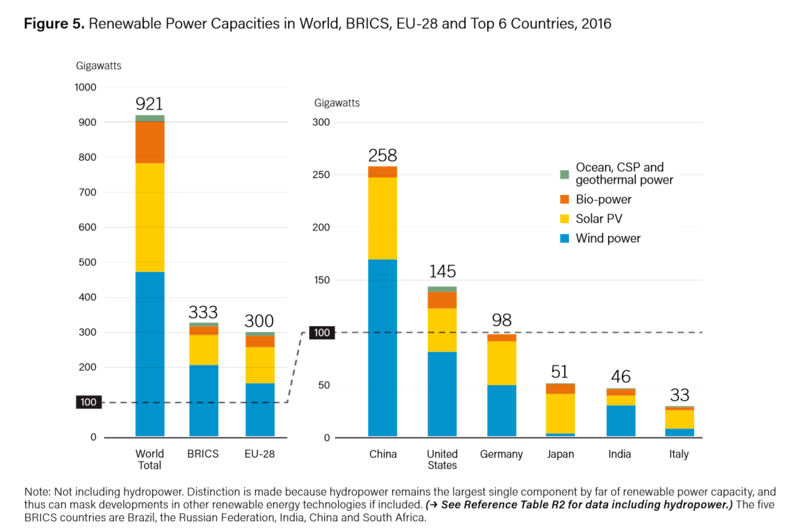 In just 10 years China has rocketed ahead with a dominant global market share in wind and solar! Buckminster Fuller called for a “design science revolution” that elevates the standard of living for all. It’s a “clean energy revolution” that dramatically shifts our electric power and transportation system away from fossil fuels to renewables like solar, wind, biomass, geothermal and hydro. In cooperation with Japan and Korea, there is call for the Asian Super Grid, which connects this growing renewable energy production to distant cities and industry. We are currently seeing how climate change strengthens storms in Nepal, India and Texas. The answer requires a clean energy revolution – on every continent and in every nation. Starting now! p.s. What can you do in your own home, business and city to choose clean and efficient renewable energy resources?